This C-130J Super Hercules is on a regular mission over North Carolina, not escaping an alien fireball. But the 75,000 pound cargo beast is still so powerful, it warped the entire sky behind it. Vortices form because of the difference in pressure between the upper and lower surfaces of a wing. Generally speaking, when the air leaves the trailing edge of the wing, the air stream from the upper surface is inclined to that from the lower surface, and helical paths, or vortices, result. 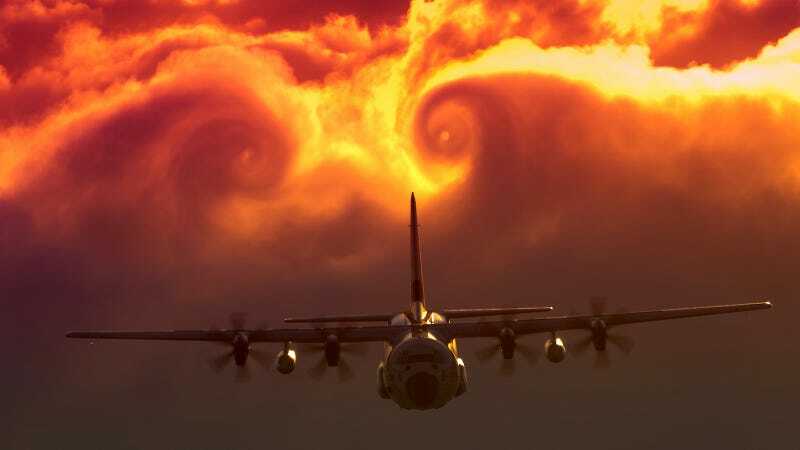 The vortex is strongest at the tips and decreasing rapidly to zero at midspan: a short distance downstream, the vortices roll up and combine into two distinct cylindrical vortices that constitute the "tip vortices." The tip vortices trail back from the wing tips and they have a tendency to sink and roll toward each other downstream of the wing. Although they eventually dissipate at a certain distance from the wing, wingtip vortices cause additional downflow behind the wing and form the major component of wake turbulence that can be extremely dangerous.